We love finding MnDOT’s historical documents. Best of all, the PDF files are searchable, so you can find specific info. View in your browser, or download for later. Have something to add to this page? Contact Karen. Watch TPT’s MnDOT documentary that inspired this website. Or read a PDF transcription of the video that is searchable. Minnesota Department of Highways. 1964. Maintenance Area 5A Wayside Rest Area Inventory, PDF 13MB, includes only Lilac Way parks, 13 pages. See reflections.mndigital.org for 26-page original source. Glenwood Avenue Roadside Parking Area was razed in 1959, so it was not included in this 1964 inventory. The three wayside rest areas below were included in this 1964 inventory, but have not been considered part of Lilac Way. This may need to be re-evaluated. Excelsior Boulevard Roadside Parking Area in St. Louis Park was razed in 1969, and Glenwood Avenue Roadside Parking Area was razed in 1959. Therefore, they were not included in this 1997 inventory. MnDOT. Trunk Highway 100 Reconstruction from Glenwood Avenue to 50th Avenue. 29MB PDF, 302 pages. Please note that this is a large file that was digitized by Google Books as part of an ongoing effort to preserve the information in books and make it universally accessible. (Since the pages are scanned, this PDF is not searchable). These reports are referenced on the 1997 MnDOT Historic Roadside Development Structures Inventories. I would love to add these PDF files to this site. Please contact Karen if you can help. Annual Report of the Accomplishments of Roadside Development Along the Trunk Highways in Minnesota. Minnesota Department of Highways. 1938 and 1939. “An Appraisal Inventory of Work Done with W.P.A. and Other Federal Relief Funds Through the Functioning of the Department of Highways, State of Minnesota.” Unpublished manuscript, 1938. Biennial Report of the Commissioner of Highways of Minnesota. 1935-1936 (pub. Jan. 1, 1937; 1937-1938 (pub. Mar. 1, 1939); 1942-1944 (pub. Dec. 1, 1944). Henning, Barbara J. Phases I and II Cultural Resource Historical Investigation: T.H. 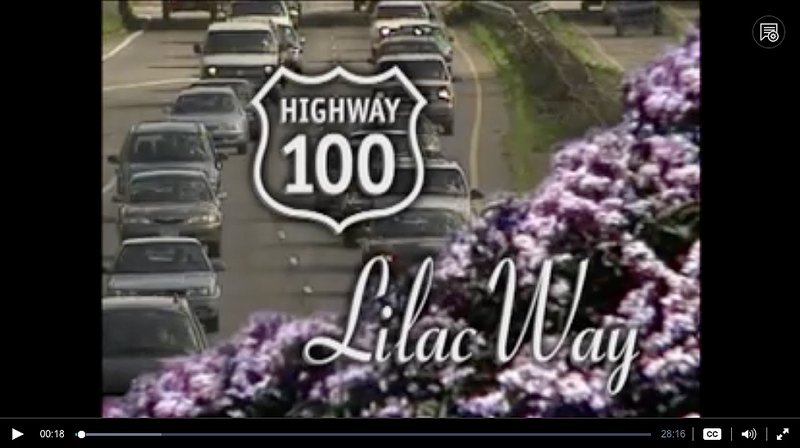 100 (Lilac Way) S.P. 2743. Prepared for Minnesota Department of Transportation by Rivercrest Associates, Inc., September 1997. Lee, Rudolph. “Highway Department Approves ‘Lilac Way’ West of City.” Minneapolis Journal, July 28, 1935, pp. 1 and 4. “Lilac Way Here Soon.” Minneapolis Journal, Jan. 30, 1938, p. 2. Meyer, Scott B., Richard L. Mattson, Andrew J. Schmidt. Phase I and II Cultural Resources Investigation for Trunk Highway 100 Reconstruction. Prepared for Minnesota Department of Transportation by The 106 Group Ltd., Feb. 15, 1995. Nichols, A. R., comp. Album of Roadside Development Projects. 7 vols. Photo album prepared for the Roadside Development Division, Minnesota Department of Highways. Ca. 1937-1941. Olson, Harold E., comp. Historical Markers in Minnesota. 4 vols. Prepared by the Roadside Development Division, Minnesota Department of Highways. Ca. 1942, updated ca. 1954. Schmidt, Andrew. Inventory form for Blazer Park. July 15, 1994. 2006 Currents – New Deal Roadside Landscape Features: Bibliography, Historic + Contemporary Resources. Sadly, this is only a list and does not link to any of the actual files. But an interesting reference list. Community Roadside Landscape Partnership Program dot.state.mn.us. MnDOT’s Office of Environmental Stewardship provides technical and financial support to communities to install and maintain landscape plantings on eligible state highway rights of way. Possible option for Graeser Park or Rock Island?